The urge to join the nursing fraternity started for me when, as a child, I used to see my grandfather returning home in his uniform and listened to the stories he told. The eldest son of a Nigerian chief, my grandfather was educated by missionaries and trained as a nurse before coming to the UK in the late 1940s. After training as a psychiatric nurse, he worked extensively across two hospitals until his untimely passing in 1991. As a black man from a different country, my grandfather experienced unspeakable abuse almost daily, from colleagues and patients alike. Yet he endured, and his help, support and encouragement paved the way for me to explore a pathway based on the principle ‘first, do no harm’. He taught me that the nursing profession is a noble one, but that you have to make your own mark and be willing to go the extra mile. You need to remain steadfast in the face of adversity, as people are depending on you for your help and skillset. My grandfather instilled in me that I am not, nor will I ever be, a minority. I have been a nurse for more than 20 years now, and have trained and worked with many people from all walks of life. Yet I can still be referred to as ‘Dena… you know Dena… the black nurse’. Winning such a prestigious award is highly gratifying, and recognition that I can apply to my career development plan. Dena Ross (holding award) and Sue Wills (centre) at the RCNi Nurse Awards 2017. 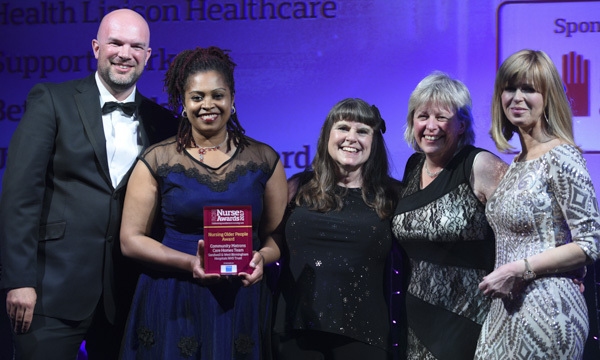 The RCNi award reflected what my colleague and I achieved within our area, but I was disappointed by the lack of representation across the categories from black and minority ethnic (BME) nurses, students and support workers. It remains a duty of the NHS to promote BME staff and provide avenues for them to shine, but that suggests we are not out there shining every day. On the contrary, we are. Well, I did, and I would enter again. I want to encourage my colleagues to enter, and to not allow lack of recognition in the past to cloud your daily achievement of being the best you can be. BME nurses reflect the diversity of the society and communities in which we are based, but this is not evident at the upper echelons of management. With little to no representation of people from BME backgrounds it is difficult to promote initiatives and ideals. I urge my nursing colleagues to focus on increasing BME numbers in management, to ensure fair representation locally and nationally, and to nurture staff to mentor and develop others. Let us be part of an organisation that does not have to look at award categories and say ‘we have no representation of black nurses’. Instead, let's develop one that says ‘look at the achievements of our collective community of nurses’. I want to see the promotion of a culture of blowing your own trumpet. The RCNi Nurse Awards are an excellent opportunity for BME nurses to demonstrate how they have improved care for their patients.